I could pound fish tacos all day. 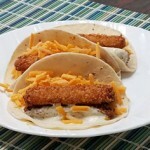 Breaded white fish, mayo, salsa, cabbage, and a tortilla? Oh, hell yeah. Even so, there's room for improvement. Enter green hot sauce. Mix the hot sauce and mayonnaise in a small bowl. Refrigerate while the fish sticks are cooking. Bake or fry the fish sticks per the instructions. Spread equal amounts of the mayo in the center of each tortilla. Add the fish sticks, then everything else.